Even their ziggurats were supposed to be living calendars. One of the largest ones they have has 91 steps on each of the four sides, and including the top, that equals 365 steps. 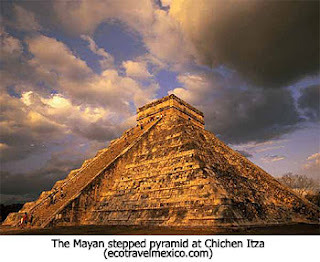 On the spring solstice of March 21st every year at the big Kukulcán Ziggurat (pyramid) down in Mexico, when the sun hits it at 3 o'clock in the afternoon, the shadow on it looks like a serpent that wiggles down the stairs and comes down to this big serpent head at the base. The Mayans were able to position the ziggurat where that shadow would move to the right place — absolutely stunning!